Summer is in full swing for our family. The kids have been out of school for a week and we've already started up the summer reading program at our local library, attended Clover Kids day camps and had TBall practices and games. Before the summer progresses too much further I wanted share what the kids and I came up with for our annual Summer Bucket List for this year! Last year we used this template and we found the best success with it. It helped us narrow down our ideas, and it also helped up plan out and think through our activities monthly. Not to say our past year's Summer Bucket Lists (2016, 2015, 2014, 2013) also didn't have some success but I do have to say, over time we have gotten better at embracing planned days, spur of the moment days, and lazy days. All of our past Summer Bucket List items have not only created a lot of great memories, but several have even become family traditions. So let's dig into the list a little bit further! The first one is simple but yet unanimous for everyone - go swimming! Summer isn't complete without a few trips to the pool. We are lucky to have two public pools within 15 minutes from us and a lake within 30 minutes. Our goal is go swimming at all of them and to play at the new splash pad being built right now in the town we live outside of. Next up is Pizza and Park Family Nights. This is a repeat list item and has even become a summer tradition but the kids insisted it make the list so we don't forget to do it! This one is simple - explore a park and bring a Casey's pizza along with us. We do this throughout the summer at both local favorite parks and at parks we've never been to before in our area or while we are on road trips. We are very excited to go see Incredibles 2 this summer. The original Incredibles movie has been a long-time family favorite of ours and we all can quote pretty much the entire movie. "Honey?" "What?" "Where's my super suit?" "What?" "Where - is - my - super - suit?"... "The public is in danger!" "My evening's in danger!" "Tell me where my suit is, woman! We are talking about the greater good!" "Greater good? I'm the greatest good you are ever gonna get!" We are very fortunate that all of our kids' cousins live within a couple of hours and that they have such great relationships with all of them. Every year we invite all of the cousins to stay with us during VBS week, but it hasn't always worked out each year. So the kids made a special request that we have a cousins weekend at our house. Last on our Summer Bucket List is a list of places we want to visit. We have plans to visit the Grotto of Redemption in West Bend, Iowa with one of my Grandmas later this month. The kids have never been and it is definitely worth of trip for anyone if they are in North Iowa. Next stop is the Fossil Park in Rockford, Iowa. We have never been and can't wait to look for fossils and explore the park. We are also looking forward to checking out the festivities in Waterloo, Iowa as they celebrate John Deere's Centennial later this month. They have lots of kids activities planned, concerts, and of course lots of tractors on display. The last day trip is up to Minneapolis to go to the Science Museum. They have a Towers of Tomorrow LEGO special exhibit right now that the kids are excited to check out. 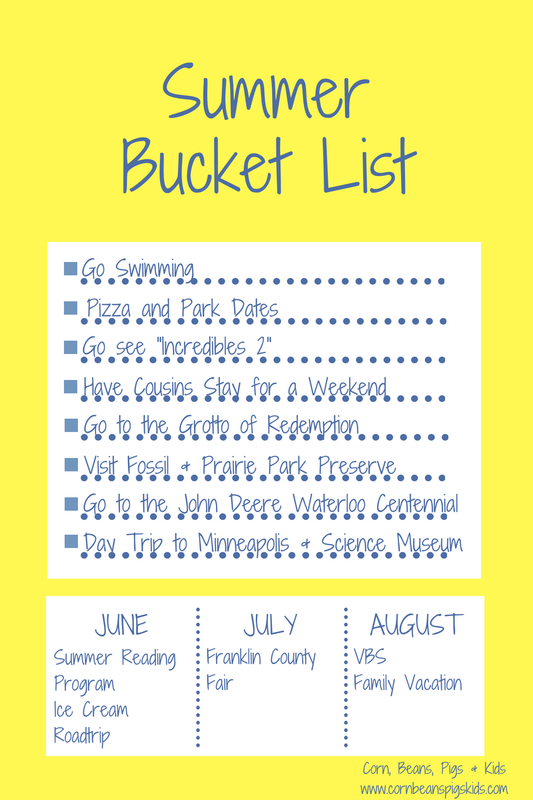 And of course we're signed up for Summer Reading at our local library, are going on our Iowa Ice Cream Road Trip, are already gearing up for the Franklin County Fair, and are looking forward to VBS and a family vacation to Wisconsin this summer. What is on your summer bucket list? Also, where do you recommend our family go to on our Wisconsin vacation? Remember to Comment for a Cause. I love that you guys make these bucket lists! This sounds like a great summer to me! We have so much fun creating and doing them! Thanks for sharing this amazing summer bucket list with us, i will also add some beautiful destination in my bucket list. Good guide keeps sharing. AN Amazing bucket list for summer travel thanks for sharing this bucket list with us. Such a fantastic family summer bucket list you have added here. Thanks for all the great sites which I have found on here. I have also make make a bucket list for summer vacations. A fantastic bucket list you have added here. Thanks for all the great list which I have found on here. Good Summer bucket list for next travel journey, thanks for sharing this ultimate summer bucket list information. Such a beautiful bucket list I have seen on your post. You have good design of blog with best bucket list and valuable information about it which is really nice to know about it. Thanks for sharing this post here. Thanks for Sharing Best Bucket list for honeymoon and holiday journey i would say very nice blog. looking international honeymoon destinations on your budget here are the best places on discount rates.